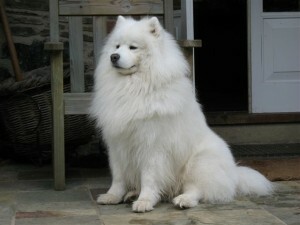 A well-groomed Samoyed makes a really stunning sight. Their beautiful thick, double coat, which can be white or cream does take time to look after, but if grooming is done on a regular basis, it will take less time in the long run. If their coats are left to become dirty and matted, it can take hours to groom, and it is hard work for you, and very uncomfortable for your dog. Your puppy should have been brushed daily by the breeder, so when you bring him home he will know exactly what to expect when the brushes come out. Start by brushing the puppy when he is on your lap, then as he gets bigger make him lie on a table (with an anti-slip top) so he is comfortable and he will enjoy the time you spend grooming him. Grooming on a table makes it so much easier on your back, than leaning over a dog on the floor. Ideally you should quickly brush over your Samoyed each day, after their walk, to remove any twigs or bits that have stuck to their coat. Then once a week spend time to comb out his coat, right to the skin. Use one hand to flatten the coat, then part the fur with the comb, and comb away from you, making sure you get right down to the skin. Work your way along the body, in layers, and pay particular attention to the elbows, hocks and ears, as these are the first places where the coat begins to matt. The tummy and inside the back legs can be very tender, so be careful not to pull the coat too much in this area. When you have finished combing both sides and around the ruff, give the coat a good brushing, remembering to brush forwards towards the head. When you lift the dogs from the table he will probably shake, and his coat should stand out, fall into place, and look a picture. 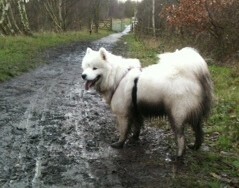 About once a year your Samoyed will moult/shed their coat. At this stage grooming will take much longer, as most of their undercoat will come away from the skin. If this is not combed out it will form into big matts, and will be most uncomfortable for them. This shedding can last for several weeks, but you will soon see the new coat growing through. While you have your dog on the table it is a good time to check their nails. Most dogs keep their nails short by walking on hard roads, but if they do get too long then they will need clipping. Nail clippers can be purchased from most pet shops. Be careful when clipping nails that you don’t clip too short and make them bleed. Teeth should also be looked at. Start looking at the teeth at a young age, and get your dog accustomed to having his teeth brushed. Tartar causes gum disease, and should be removed. Feeding hard biscuits usually keeps this in control, but if the build up is too much, it will need veterinary attention. I think I will need a bath! With regular grooming the coat should keep quite clean. 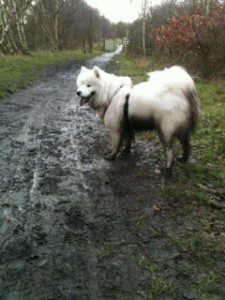 However, there are times when your Samoyed will need a bath. Before bathing the coat should be thoroughly groomed to remove all dead hair. Stand the dog in the bath and soak the coat all over, apply a shampoo, rinse well, and repeat. Be careful when washing around the face, not to get shampoo in the eyes and ears. Squeeze out as much water as you can, and if possible, wrap a towel around him and get him outside to shake, before he shakes in the bathroom. Rub him with more towels, until he is as dry as you can get him. Then use a warm hair-dryer to finish off. Run your fingers through the coat as you dry, and be careful not to burn the skin. When he is dry, brush the coat through again. Your Samoyed will look magnificent after all the grooming you give him, be proud of him as you take him a walk – he will certainly get noticed!